Also feature dual vents with flame arresters, adjustable feet, grounding connector, and trilingual warning labels. 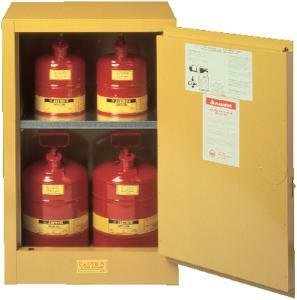 Compac Safety Cabinets fit almost anywhere and provide protection even where space is at a premium. These cabinets are ideal when storing lesser quantities of flammable liquids at a workstation or adding to existing storage capacities. Only 23-1/4 in. 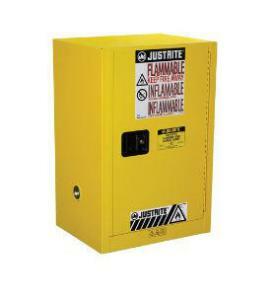 (591-mm) wide, they hold a full 12 gallons (45 L) of flammables and have all the great features and benefits of our classic Justrite® cabinets.